My email to EM askin them to add a disclaimer concerning the actual date of the info in their blogs. Your request (140364) has been solved. To reopen this request, reply to this email. Thanks for the feedback Johnny! I'm sure ya'll know what you're doin,, but, when using old blogs, I think you should say, this is old news, and then give the date. That way someone reading it won't mistake it for "new" news. I checked the currant blog and I see no disclaimer. This should be in the jokes thread. A common saying tells us to “not sweat the small stuff.” While this may be sage advice in our daily lives, the phrase is not applicable when it comes to bringing a new vehicle to market. In terms of manufacturing and engineering, sweating the small stuff is a vital aspect when endeavoring to produce a quality vehicle. As we continue down the path and take our supporters along the journey, we will continue to show the small details that culminate to make up the Elio. Today’s blog from the archives will look at one of these overlooked details: automotive seals. 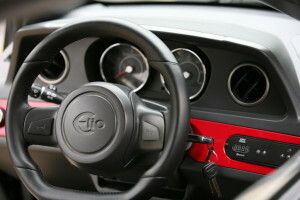 Automotive seals are used in a number of important locations throughout the vehicle. Sealing is critical for resisting water intrusion, as well as sealing in connectors to displace water from the connection. Sealing the body of the vehicle is important to keep out moisture and to prevent corrosion of internal components. The sealing technology we are utilizing, supplied by Cooper Standard, reduces weight and improves safety, cabin acoustics, occupant comfort, and the aerodynamics of the vehicle. Sealing is used around the door for displacing water, keeping out dirt, protecting the door when it is slammed, as well as limiting wind noise. Both door handles, interior and exterior, are also sealed. The windows have sealing on both the inside and outside to redirect the water. 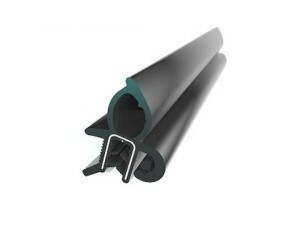 These are utilized to minimize water intrusion, as well as prevent noise caused by wind. The hood has a seal located at the closing area to manage the slamming of the hood, prevent debris and water from reaching the engine compartment, as well as reduce NVH. Seals are used in the exhaust vent to ensure that the door shuts properly, and manages the exchange of air when using the HVAC. 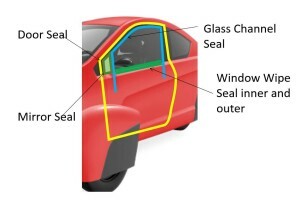 Additional seals are used in the electrical components, electrical connectors, lights, front windshield, mirrors and most any opening on the vehicle. Door testing, which includes the cycling of the door (open, close, open, close…) window cycling, high-pressure water testing, and door slam noise quality. When you’re driving your current vehicle, its seals are probably far from your mind. If the vehicle is poorly sealed, however, it will be a source of constant frustration. By sweating the small stuff and focusing on the many small details that make up a vehicle, while also keeping an eye on the larger picture, we can produce a quality and lasting vehicle. hawg_ryder and TexasTesla like this. RUCRAYZE and ehwatt like this. We believe that a happy medium can exist, one where both Luddites and techies are satisfied. The Elio Motors philosophy is simple: we want to provide our customers with everything they need while allowing them to add the newest available tech. The design and function of the standard Elio is based on a desire from Elio customers for a simple, yet modern design with the option for customization. The base model of the Elio comes equipped with air conditioning, heat, defrost, an AM/FM radio, and a standard instrumental panel. The original design for the Elio dash was based on an Elgin Lord watch, which is a tribute to Paul Elio’s father. While the dash may be available as an option, we decided to move forward with a traditional dashboard featuring standard gauges. This decision was based on reservation holder feedback, as well as a desire to keep costs and development time at a minimum. While the Automotive News article points out a trend toward simplicity, there remains a strong demand for the most cutting-edge automotive tech. For this reason, we developed our ePlus: My Elio, My Way option program. 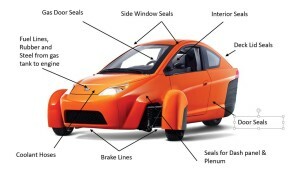 Through ePlus, Elio Motors customers will be able to add the technology they desire a la carte. This program also means that Elio owners can bring their vehicles to an Elio Motors store and add options after the purchase, allowing them to stay ahead of changing tech trends. Many auto buyers have signaled a yearning for simplicity while others endeavor to keep with the latest and greatest automotive technology. At Elio Motors, we believe our vehicle presents itself as an ideal choice for both groups. So, if you consider yourself a purist, a techie, or anything in between, the Elio is the vehicle for you. My favorite vehicle (that I owned) was a 1973 Datsun Z. A simple (compared to today’s vehicles) and straight forward machine that was a blast to drive. I had the same sort of feel sitting in the Elio. Francisco, ehwatt and Johnny Acree like this. If they really wanted to keep it simple they would only produce in one color. As it is, it's invisible.